Suzuki Motor Corporation is a Japanese multinational corporation headquartered in Minami-Ku, Hamamatsu that manufactures automobiles, four-wheel drive vehicles, motorcycles, all-terrain vehicles (ATVs), outboard marine engines, wheelchairs and a variety of other small internal combustion engines. The Suzuki Hayabusa is a sports bike motorcycle made by Suzuki since 1999. It immediately won acclaim as the world's fastest production motorcycle, with a top speed of 303 to 312 km/h (188 to 194 mph). 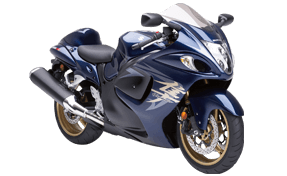 The Hayabusa's abundance of power at any engine speed made the Hayabusa easier to ride by giving the rider a greater choice of gear selection for a given speed and stunning acceleration. Hayabusa is an ideal sports bike for those who are not that into track racing but love superbikes for their extensive power and ability. The Hayabusa has been one of the top choices for street bike customization perhaps evens the most popular customized sports bike. One reason may be the unique, instantly recognizable bodywork. The easy tenability of the engine, the wide selection of aftermarket parts, possibly more than any other Japanese motorcycle and the interchangeability between models of Suzuki parts have also played a role. Suzuki has introduced the second generation of this bike in India. The new variant comes with improved aerodynamics which makes it look better than before. The bike looks extremely bulky from its front. Its front fairing houses its vertically placed headlight and clear lens indicators. Just below its headlight, Suzuki has placed a broad front fender which completely covers its front forks. The wide and long visor further enhances its look with integrated black colored rear view mirrors. The ram air ducts at the front of the drooping, rounded nose squeezed frontal area away from the headlight, and this, along with the need for a narrow frontal area, necessitated a stacked headlight and high beam behind a single lens. Suzuki has neatly designed its fuel tank which gives it a premium touch. Its single seat complements its rear designing. The bike features a partly black colored fatty silencer with the diamond-like coating. The rear cowl houses round shaped LED tail light and up-raised indicators which looks fancy with its broad rear tyre. The twin headlamps on the Suzuki Hayabusa are vertically stacked and this is how the rider instantly recognizes that it's the big bike. The motorcycle features a new ABS system and Brembo Monobloc front brake calipers. Wheelbase and ground clearance stand at 1480mm and 120mm respectively, whereas the seat height is around 805mm. The engine used a gear-driven counterbalancer to reduce vibration to the point that the engine could be solidly mounted to the frame, for the purpose of increasing chassis rigidity. Employing a conventional twin-beam frame, fully adjustable upside-down forks, using specially developed Bridgestone tires, and being relatively light at 473 pounds (215 kg) dry, the Hayabusa's handling was considered excellent for a machine of this class. Mechanically, the 2017 Suzuki Hayabusa is powered by the 1,340cc inline-four engine that produces 195PS of power at 9,500rpm and a peak 155Nm of torque at 7,200rpm. The suspension was upgraded with a 43 mm Kayaba inverted fork with sliders having a diamond-like carbon (DLC) coating. The rear shock is also a Kayaba, and the overall suspension is firmer than the previous model. There are as many as five circular dials in the instrument console of this bike along with all essential LED indicators. The bike has an analog tachometer, fuel gauge, and temperature gauge. he bike receives new color schemes which include Glass Sparkle Black or Pearl Glacier White (AGT), Pearl Vigor Blue or Glass Sparkle Black (BBD) and Glass Sparkle Black (YVB). Hayabusa is one of the best values for money product of its type, placed at a perfect point and carrying loads of more power than similarly priced bikes. It comes with an iconic design and yes, one should definitely go for Hayabusa in this segment. Guards against both man-made events, such as burglary, theft, strike etc as well as natural disasters as fire, self-ignition or lightning etc.